I wanted to do something different for Mother's Day this year (as opposed to my normal not doing much of anything at all). At an event earlier this year, I met an instructor at a cooking school in Vienna near my parents' house and that seemed like it would be a fun thing for my mom and I to do together. Mom chose the "Luscious Tarts" class, so last week we headed to Culinaria Cooking School to learn how to bake some tarts. 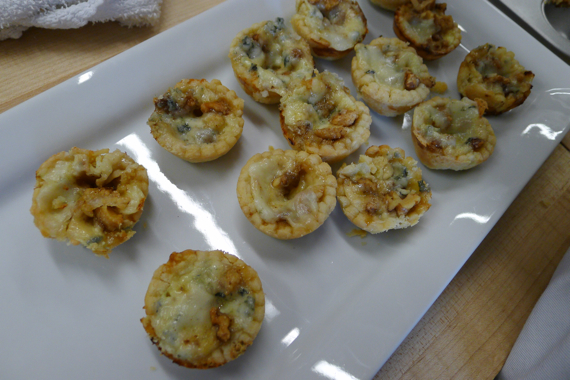 It was an ambitious class: we made little blue cheese tartlets with a Roquefort-candied walnut topping, a caramelized onion, leek, and bacon tart, and a pear tart. That's a lot of tarts! I love the idea of making your own crust, and now I feel more confident about doing so. Just need to get some pie weights and I'll be in business. A fun tip: for the tartlets, we rolled aluminum foil into balls and wedged them into the crust during blind baking so the little cups would keep their shape without puffing up. Mom and I had to pair with two other ladies and work together on the recipes. At first, it was kind of awkward deciding who would do what. I bake occasionally at home, but there I felt a little pressure to do everything just so. "Everyone is watching me as a I scrape this bowl," I thought. That's why I like cooking by myself, you can take your time and do things the way you want. But it was nice to work in a group as well. Brought back home-ec/teen-living memories from my middle school days. It was a lot of fun, our teacher Marilena was a calming presence, and the really cool part is that assistants kept swooping in to clear away our dirty bowls and utensils. If only they were in my kitchen all the time, things would run a lot smoother. I wanted to share the recipe for our dessert tart. This was my favorite. It was kind of like a giant cookie. Chewy and flaky and delicious! Aside from the time chilling in the fridge and baking, the actual prep goes really quickly. You could use pears, or plums, or peaches. Any fruit but berries, according to Marilena, who graciously allowed me to post the recipe here. 1. Butter a 9" springform pan. Slice the pears to 1/2" thick, place them in a bowl and squeeze half the lemon juice over them. 2. In a small mixing bowl, whisk together the flour, baking powder, and salt. Set aside. 3. With an electric mixer, cream 1/2-cup butter and 1-cup sugar together on medium speed, until light and fluffy, about 3 minutes. Beat in the eggs, one at a time, and then the vanilla. Beat in the flour mixture (on low), until the batter just comes together. 4. Spread the batter in the prepared pan. Wrap and chill for at least 20 minutes. 5. Preheat the oven to 375 Fahrenheit. 6. Remove the chilled pan from the fridge and arrange pears in tight concentric circles on top of dough. Squeeze remaining lemon juice evenly over the pears. 7. In a bowl, mix the cinnamon with 2 tablespoons of sugar. Sprinkle over pears. Bake for 45 to 55 minutes or until the edges are golden and the center is set. Cool the tart in the pan for 10 minutes. Run a sharp knife around the edge and then remove the sides of the pan. The tart can be served warm or at room temperature. 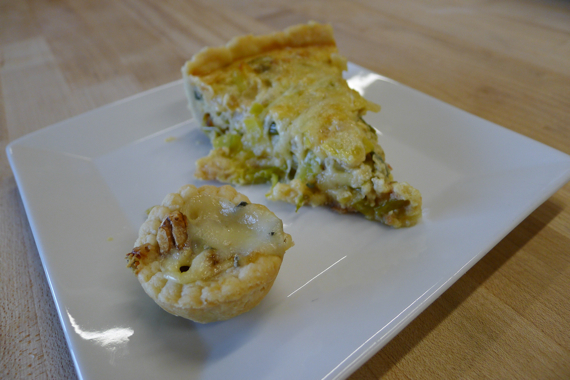 Posted in Food, DC and tagged with Culinaria Cooking School, Recipe, Tart. June 13, 2013 by Adele Chapin. The sentiment in Wednesday's post applies to my cooking too... Whenever I try to make food for my book club, I find a way to eff it up. Either not cooking things enough, or in this case, way too much. I had a cute idea to make homemade granola and do a granola bar, with fruit toppings, soy milk, organic milk, and Greek yogurt for each girl to doctor their granola as they saw fit. I tried to make Joy the Baker's Cocoa Almond Granola, and the problem was that I followed the recipe to the letter, even though it was on its way to being burnt well before the 30 minutes mark. Yet I kept baking it. I know it has cocoa powder, but it shouldn't have turned out looking like dark chocolate. Determination set in. I whipped another batch that evening, and it was terrific. Sure, my guests wouldn't get to eat it, but I felt vindicated. I refuse to let granola defeat me. My friend is taking nutrition courses and she said the founder of her school said it's ok to burn a recipe the first time you make it. That made me feel better too. ETA: I used almond slivers and toasted the granola for 15 minutes at 300 degrees, stirring twice. May 3, 2013 by Adele Chapin. Cherry Blossom Cocktails in D.C.
We're supposedly heading into peak cherry blossom blossoming. Or has it already happened? Seems like an inexact science. Let's leave that to the tourists to decide. Earlier in the month, I wrote a post for R29 with a few delicious cherry blossom-themed cocktails around Washington. I like the idea that the cherry blossoms, as gorgeous as they may be, are pretty much the same every year, but you can find so much variety and creativity with all of the different cherry-themed drinks and dishes for the festival. Here's the Angelina, made with Don Ciccio & Figli fennel liquor, cherry shrub and cognac from Room 11 in Columbia Heights. I adore Room 11 — cozy space, interesting cocktails, good people! We celebrated Christine's birthday there last week and had a great time. We asked the bartender if he could make a special birthday cocktail for Christine. Turns out the last time someone asked this, he ended up in the City Paper's Cocktail Guess column. Sort of funny. Maybe it's not a common request? Posted in DC, Food and tagged with Cocktails, Room 11. The Mount Pleasant Farmer's Market opened for business this Saturday, and even though it's held on a piece of pavement about the size of the postage stamp, it really makes the neighborhood a special place. Flash backward to the last day the market closed in fall 2012. Joe and I stood in line for the pork bun vendor. The pork buns are from the People's Bao and they are a pretty great market lunch. Joe is majorly obsessed with them, which makes what happened even sadder. The line was about 10 hipsters/yuppies deep, and we watched with bated breath as the pork supply dwindled. Sure enough, it was our turn and the guy said, "Whoops, ran out of meat." Now here it is, six months later, and we're back in line to try our luck again. Of course, the same thing happened and the pork runs out exactly when we're at the front of the line. It was a nice bookmark to close and open the pork bun season. Joe was silently fuming as we walked away. But there was nothing I could say to make up for the injustice of it all. We kept walking down the block and then an older lady in a wheelchair stopped us. "I hope you two are still holding hands 10 years from now," she said. "I hope so," Joe told her. I hope so too. It was such a nice day that we walked to the zoo. A few of the animals were out, namely a pair of squabbling sea lions that I could've literally watched all day. They fought over control over the same rock, and it was quite exciting. That night for dinner I went with my in-the-know friend Carolyn to her friend's Columbia Heights supper club for his catering business. I ate many courses of yummy Vietnamese food and chatted with amiable strangers. Unfortunately, I also drank wine and talked about 2 Chainz. A lot. Sorry, amiable strangers. The next day, we went to a fun dinner at the new Beuchert's Saloon in Capitol Hill with my friend Betsy and her husband. I told Joe where we were going over the phone. "A balloon?" he said. "No, a saloon!" It was appropriately old-timey, with a guy wearing a bow tie and two buffalo heads stuck on the wall. The food isn't inexpensive, but we definitely enjoyed it. I recommend the oxtail tagliatelle, any of the root vegetables, and the fries — you know you want to order them. Next time, I'm getting the burger with the fried egg to accompany. Posted in DC, Food and tagged with Beuchert's Saloon, People's Bao, National Zoo, B. Lin Catering. Shameless self-promotion first: I compiled a long list of restaurants with special Easter menus, so check it out on Eater if you need Easter plans! There are so many delicious-sounding brunch items. I've been tasked with finding a restaurant for my family on Easter Sunday, but the caveat is that it needs to have dog-friendly patio seating. This twist surprises no one who knows my parents. I actually might have an answer: perhaps Art and Soul's puppy patio could fit the bill? I'm worried it will be too cold to eat outside though. This has been such a cold spring. Speaking of Easter, have you seen this marketing tactic on H Street? It's for a leasing office, I think, and they've set out baby chicks in the window as a "live peep show." The chicks looked so anemic and helpless, it mainly made me sad. And I wondered what would happen to them after Easter is over. I don't think this is PETA-approved. On Saturday, I went to our friend's charity chili cook-off, and in between all the crockpots of chili, there was a tiny, fuzzy puppy napping in the corner. I took a picture for posterity. Here is Alex, with a plastic spoon in his blazer pocket at the ready for chili sampling. It looked quite jaunty. Not pictured: a Miller Light in the other pocket. Then we high-tailed it over to Le Grenier, the new French bistro on H Street. The Le Tigre menu is charming, oui? It's sort of obvious to use the adjective "charming" to describe this place, but it's definitely fitting. We sat at the bar and snacked on a little bowl of frites and an assortment of five cheeses, with chutney and a yummy pate. But the best part is the bartender kept serving us piping hot baguettes straight from the oven. Keep it coming, I say! Joe is dog-sitting for a whole week, so we said it's a good way for him to experience a taste of the responsibility of dog ownership. This is his practice dog. She is very sweet! Meanwhile, I had lunch with my dad on Saturday. We had to eat outside, of course, because Dad brought the dog along. While we were eating, Rain the dog took her nose and knocked my dad's plate out of his hands, then proceeded to eat all the food that landed on the ground. It was diabolically clever, and I have to give Rain props for that one. Posted in DC, Food and tagged with Le Grenier, Joe.